23-time Grand Slam champion Serena Williams is enjoying some downtime ahead of next week’s US Open. The American star, who lost in the second round of the Cincinnati Masters last week, is making the most of the last few days off by promoting her clothing line Serena. And guess who she bumped into in New York on Wednesday? Nicki Minaj. Williams later took to her official Instagram account to share a ‘boomerang’ with the rapper, accompanied by a ‘royal’ caption. “Queen + Queen = Royal. Me and @nickiminaj having fun with boomerang. Wearing the royal hoodie by @Serena,” she wrote to her 9 million followers. Queen + Queen = Royal. Me and @nickiminaj having fun with boomerang. Wearing the royal hoodie by @Serena. Link in bio!! 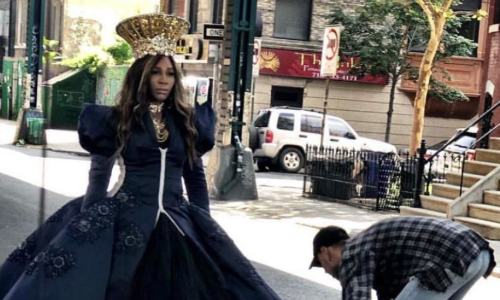 Earlier in the day, Williams wore a royal black dress and a crown as she posed like a queen on the streets of New York City. Meanwhile, the 36-year-old is scheduled to get back on court for the season’s third Major, for which she’s been seeded 17th in the women’s singles event.